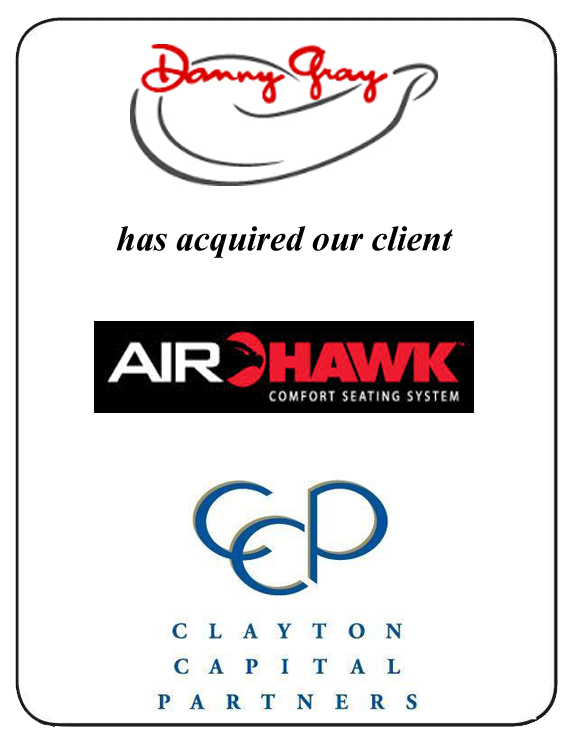 Clayton Capital Partners is pleased to announce the sale of its client, Air Hawk Comfort Seating System, to Danny Gray. Air Hawk Comfort Seating System (www.airhawk.net), based in, Belleville, IL., is a motorcycle seat overlay that provides the rider with unsurpassed comfort during long rides. Danny Gray (www.dannygray.com) based in Santa Ana, CA, is the world leader in creating high performance, purpose built seats for motorcycles from leading manufacturers like Harley Davidson, as well as being the choice of top builders for one-of-a-kind seats for their custom bike projects.